Beautiful Hydrangeas in blue, white and green accented with curly willow in a clear glass bubble bowl. 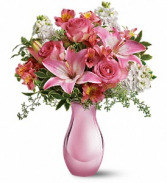 Color their world and captivate their senses with a kaleidoscope of our freshest blooms! 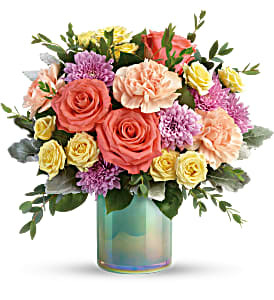 We've gathered classic roses,spray roses,Gerbera daisies and Fuji mums to help you deliver a smile for birthdays, housewarmings, get well wishes or just because. Lime green vase may vary but still be beautiful!